We have been hard at work on a new project. It is called EMPOWER, it is the most ambitious project we have done thus far and it… is… awesome. This new course is based on feedback from you, the YWA community. It is a direct response to your requests, comments and conversation. And while it might not be for everyone it is designed to inspire you to modify, adjust, deepen your practice and find what feels good. Throughout the year we get a lot of questions and requests for more Yoga For Weight Loss videos. More more more! More cravings to work out and bliss out. To tone the body but also open the heart. 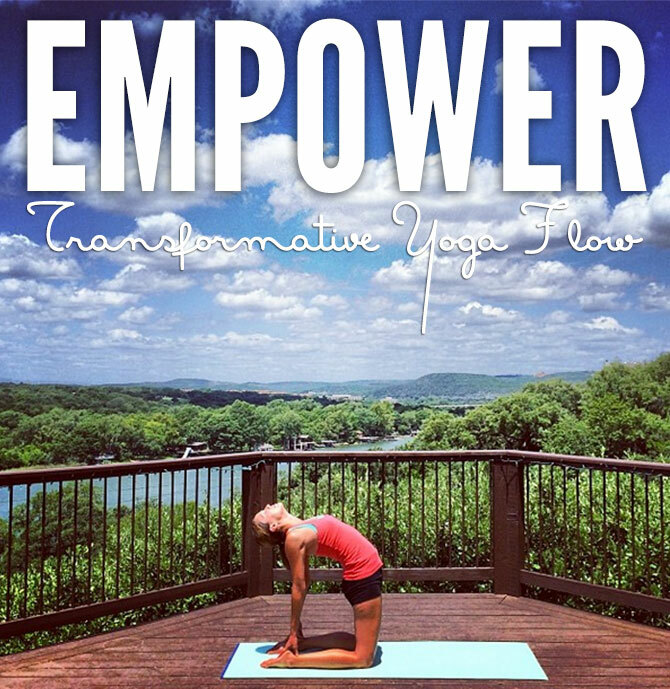 Essentially, EMPOWER is my version of Power Yoga. It’s hot, it’s fierce and it’s challenging. But it is also built to inspire joy, mindfulness and cultivate strength and support from within. For me, those are the qualities of yoga that bring you back to your mat each day. For me, EMPOWER is not about getting a bikini body (though you can!) but it is about getting strong, healthy and empowered. It is not about becoming someone else or copy-catting someone with your dream body. It is about transforming into the best and most beautiful version of you. It is about shedding the extra weight you are carrying around so that you can walk through your life lighter, with more joy and free. While EMPOWER is about getting the body into its happy, fit and optimal shape, we did not want to make a course that is all about getting six pack abs – we wanted to make a course that inspires lasting results that start from within. We are inviting the YWA Community (you) to try the course out with us before we officially launch it in the fall. You have from now until July 15th to purchase this program for only $99 (regular price will be $129). Take the EMPOWER Summer Challenge with me starting on July 15th and GET EMPOWERED. That makes it about $3 a day for this first go around and you have lifetime access to the course. All your materials are both available as downloadable and easy-to-stream. 4 full length core videos: At the Core of EMPOWER are 4 full-length yoga workouts that alternate between strength-building and Cardio workouts. There are two videos in each phase and you’ll move on to the second phase when you feel ready. Supplemental Videos: These videos fill in the gaps – allowing you to hop on the mat even when your body needs a rest or you don’t have time for a full sequence. Bonus Video: A fully guided Savasana Meditation. Downloadable PDF: This includes some notes on each video from yours truly as well as tips for getting a good workout and the most joy out of each practice. It also includes links to Foundations Of Yoga videos that can assist you preparing for the practice & learning proper action and alignment. Daily Email: A short but empowering email in your box (HEYO AGAIN!) from me. These are meant to support you and make you smile. They encourage authenticity, connect you to community and answer your questions. Topics range from the course content to healthy recipes to poetry and probably my sick sense of humor. Audio Files: Audio only files so you can practice without a screen or on the road! The EMPOWER Summer Challenge is just to get us started. There are no rules as to what it will look like. Do what you can! The goal is just to do EMPOWER YOGA for 30 days. You decide what that looks like, what works for you and get empowered as you design your home practice. Post pictures of what your Empower practice looks like and mark it #30daysofempower, dude. I hope you can join us! Send any questions my way! As always, we offer a 30-Day Money Back Guarantee on all our classes. If you’re don’t feel like you got your money’s worth just let us know and we’ll refund your purchase price. No hard feelings!